Albertans are lucky to be one of very few provinces that can boast not one but two NHL teams and this sparks an enjoyable rivalry between Calgary and Edmonton. Alberta drivers will now have a chance to show off their team pride on the QEII and also to support some worthy causes with the new Battle of Alberta plates. These plates, similar to the Support Our Troops plates, will cost $84.45, with $55 of that going toward either the Flames Foundation or the Oilers Community Foundation. $20 of the funds received will go to the province to cover the making of the plate, and the remaining $9 is a service fee payable to the registry. The Flames Foundation was founded in 1983. Since then, it has donated $32 million toward community initiatives, including funding the Rotary Flames House — a pediatric hospice near Alberta Children’s Hospital — and covering youth sport registration fees for families in need, along with funding programs through Hockey Calgary. The Flames Foundation also provides Grade 6 students in Calgary with a YMCA membership. You must go to your local Registry office to order the plate. The plate will be ordered specifically for you and will be attached to your MVID. It will not be transferable to another person, so you can’t order one as a gift. Be sure to bring your valid license plate. If you have any overdue fines, these will need to be cleared first. Pay the $84.45 fee for the plate. Please note that only class 3 passenger and government vehicles can be affixed with these plates. The plate will arrive in the mail. 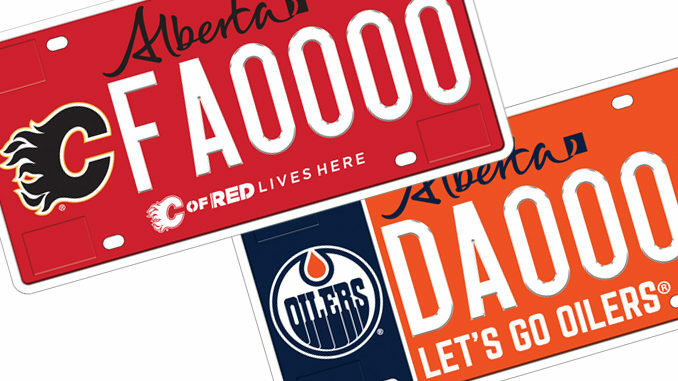 If you wish to use the plate on your vehicle, you will need take the plate to the registry to register the plate or transfer existing registration from another plate and to get new tabs for your Flames or Oilers plate. These plates are available for order starting today, so come on in to Registries Plus to order your Flames (or Oilers) plate today. Whichever team you choose, you will be supporting a great cause.